In the Royal Oak, Michigan of the early 1960’s baseball was as popular with the young male population as it was in most places. In the northern “end” (and this may be the first ever instance of the designation of “ends” to Royal Oak) baseball was played, as it was in other places in two ways: the first was played in parks and fields, in “sandlots”; the other was in the Little League at Memorial Park. Many families, my own included, were not keen on Little League ball. My mom and dad didn’t oppose my trying out, though they were likely relieved that I didn’t make a team. In fact, though, it never really occurred to most of us to try out, anyway. Of course, tryouts and teams were political. Favouritism toward the sons of coaches and officials was well known, and richly resented, especially by those talented kids that didn’t make the team, and those who did but sat on the bench most of the time. Bye and bye, though, a few kids who were good players but who didn’t make the teams they felt they should have made became more angry than had others before them. Sitting in the shade on a particularly hot day, they decided to take matters into their own hands. And the idea was born. There were six boys sitting under the tree which formed the backstop at the vacant lot field on the southwest corner of Woodland and Nakota. They started to talk about who they could get to join the team. They also started to ponder a couple of problems. The first was catcher’s gear. 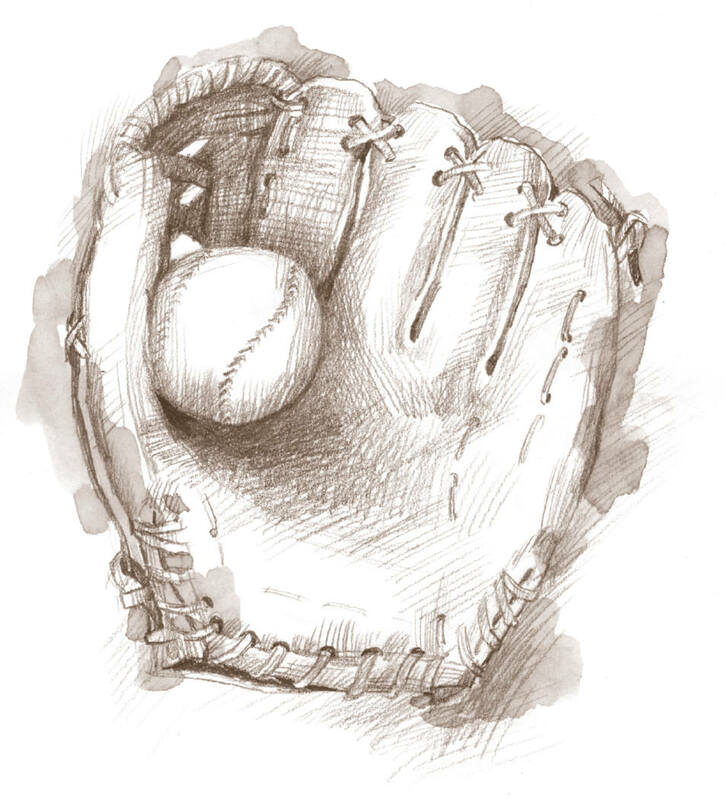 Few kids possessed much more than a glove, a ball, a bat, and a cap. Shin guards, a mask, chest protector, and a catcher’s mitt were pretty specialized stuff. “I have a lefty first baseman’s mitt,” said a big kid with glasses. “I might be able to find a catcher’s mitt,” another voice said. Word spread quickly around the neighbourhood. The next morning, about a dozen boys assembled under the tree for high level discussions. “Ask him. It would be better than all of us yelling at each other,” said Bill, “and besides, he’d get more respect than I would”. “Yeah,” said Eddie, “ he’d beat us up if we gave him trouble”. John, Eddie’s big brother, was approached after supper. Eddie recounted the discussions of the last couple of days. “Don’t give me any lip, kid, or your face won’t fit behind Yogi Berra’s mask!” John chased Eddie out of his bedroom. The next day, about fourteen guys showed up. Most were happy to see John. One guy, though, said, “won’t he play favourites with Eddie?”. John got up and said, “All right you guys, listen up. So you twerps wanna be a baseball team. Let’s see if any of you guys can do anything. Get your mitts and get out there. We’ll see if any of you guys can field”. John picked up the bat he’d brought and started hitting balls to the kids. They had mixed success. Some kids backed away from ground balls, finally letting them roll under their gloves and between their legs. Others had fly balls dropping all around them, occasionally touching a glove to a ball on its descent. John stopped and looked at the kids in the field. “You guys aren’t fielders, you’re targets!,” he said, “What are those pieces of leather on your hands for? Are you guys cold or something?”. He pointed to a big kid and said, “do you think you can hit a few balls, kid?”. He gave him the ball, and the bat he was using (which the kid refused, choosing his own bat instead). John then demonstrated the various fielding skills, first with ground balls, then with fly balls. He had the kids take turns hitting balls while the rest had fielding practice. He also stopped any nonsense about whose turn it was to bat quickly by making the kids line up and count off. Each boy had ten hits and then it was back in the field, with John stopping to demonstrate from time to time, and helping boys with technique. At last, John called the boys in and sat them down. When they all got back, he dismissed them, telling them to show up at the same time the next day. The next day, John started them off with a lap around the field. He had a surprise for them when they got back. He opened a large bag, and from it he brought out a mask, chest protector, and shin guards, as well as a well-used catcher’s mitt. He looked in the direction of one of the bigger kids and said, “you think you’d like to be a catcher?”. “Sure,” came the startled reply, as he tried on the gear. John then brought out a couple of batting helmets. As the big kid—Jimmy Beckwith—was pulling the catcher’s mask over his turn-around Detroit Tigers hat, John pulled out three very beat-up bases and started pacing off the base lines. When those were in place, he pulled out a “home plate” and plunked it down into the depression that had served this purpose up till now. “All right,” he said, smiling in spite of himself as he gazed into the faces gazing back at his. John watched and taught, with greater and greater patience and intensity. He was enjoying the challenge of getting the “Michigan Mashers” off the ground. The kids were having fun, too. They were learning about baseball, and learning about each other. Though John cracked the whip when teaching the skills of the game, he let the squabbling over being “safe’ and “out” go on, letting the kids learn about solving disputes: “I ain’t got time to be an ump, too!” he said. Little League season was well underway by the time the Mashers had started practising. School was out, and that helped a lot. John was available, with his season at Kimball being over. The kids practised every day for a couple of weeks. On a Saturday afternoon, they played a game amongst themselves. A few kids who were in Little League stopped by to watch the Mashers. They were impressed by what they saw, but tried to act nonchalant. In their turn, the Mashers ignored them. The field at the corner of Nakota and Woodland presented some problems for the Mashers, chief among them being the absence of a backstop. The gnarled old tree left at the corner of the lot was insufficient for keeping foul balls from rolling into the intersection. Likewise, foul balls narrowly missed the houses and yards on the other side of the street. Broken windows were only just avoided on three occasions. After a particularly close call, John called the boys in for a talk. They talked about it, and finally took a vote. They decided to go over to the backstop at the far corner of Jefferson School. The backstop at the park was more imposing, but there seemed to be more (unstated) sentimental reasons for going over to, what was for most of them, their school playground, and the site of their recess games of baseball and gym class games of softball and kickball. John thought this the second best choice, but went along with it. He saw a lack of shade as at least one problem. So, on some afternoons, they got together at “their own” field—“Masher Field”—for a more general practice, but for more game-like sessions, they got together at Jefferson School. The boys cheered. One of them said, after the yelling died down, “I wish we had uniforms!”. Eddie dragged the duffel bag over. John reached into the bag and retrieved a baseball uniform shirt with a block letter “M” on the front. “Beckwith, try this on…the rest of you guys’ll find something that fits in here. Sorry to say, there are only shirts. Wear any hat you like. If someone asks you why your hats are all different, tell’em you’re the Michigan Mashers, and that the different letters stand for different cities in the state—and make sure you know one that starts with your letter. Those with NY or StL (there is a Saint Louis in Michigan), or SOX, study up and USE YOUR IMAGINATION! EVERYBODY will tell me what town your hat stands for TOMORROW, no get out your maps tonight…and ‘D’ does not stand for Detroit: find another town, and no duplicates! Now, get in here and find a shirt”. The boys sorted through the shirts until everyone had found one that fit, more or less. “Where did you get these?” said Billy Forsman. Most of the boys put the shirts aside. They practised hard for a while, and then had a good “scrimmage” game, leaving the field finally with their new Mashers shirts, and high hopes for their first game. Even though it rained heavily on Friday night, the bright sun and a stiff breeze made the field at Jefferson surprisingly dry by the time the Mashers started to arrive. Soon after the Mashers had gathered, a procession of boys on bicycles, under the general superintendence of John’s Kimball team-mate appeared at the opposite side of the schoolyard and moved toward the ball field after a quick stop for orientation. Like the Mashers, they, too were wearing baseball shirts. Theirs had a single letter “R” on them. This led the Mashers to speculate on what this stood for when one of the Mashers questioned a newcomer. The first ever Mashers-Raiders game was won by the Mashers. The game was attended by very few people other than the players and their coaches, and a few other kids that happened by. There was another person, an older man whom John seemed to know. He acted as umpire, calling the game from behind the pitcher (so that he could call the plays at the bases, too). The Mashers and Raiders agreed to play again the next Saturday at the field at Upton School. They also agreed to a game at the diamond by the Pollywog Pond. In all, they played seven or eight games against each other during July, some during the week. As August came, so did vacations, and though they still played, the squads were weakened or short-handed. As time went on, kids who had played Little League ball had started to take notice of the Masher-Raider games. Many tried to join the teams, but were refused. This angered them: these boys considered themselves the cream of Royal Oak’s youthful ballplayers, and they resented the rag-tag teams with their high- school-aged coaches. Taunts were offered—and answered. Anger mounted as Leaguers looked on at the games played by the outcasts. “Prove it!” come the Mashers’ reply. The Little League’s adults were noticing, too. When a few of the better Little League players approached their dads and coaches, they came back to the Mashers and the Raiders with a proposal for a showdown. The showdown would consist of a playoff tournament to be held at the field by the Pollywog Pond. Two teams from the Little League would play a game, and the Raiders and the Mashers would play another. The winners would then play to decide the “championship”. The Saturday after Labor Day was chosen. By then, the teams would be at full strength with schools started and vacations over. John and his friend Mike (who coached the Raiders) looked forward to the showdown. They relished the confrontation with the “official guys”. They had already proven much about themselves this Summer, and looked upon the challenge as a way to crown their achievements. Soon, though, ominous rumours were heard. Although the Little League teams were supposed to be two that had played in the League that Summer, the coaches had contrived to put together two All-Star teams, with the best players from the whole League, dressing them in the uniforms of the “Yankees” and the “Red Sox” (the Little League used the names of big league teams). Some of the coach-dads of the Little League had decided that the “outlaws” (as they called the Mashers and the Raiders) needed to be taught a lesson. Little Leaguers themselves had got wind of the scheme, and started dropping strong hints in the direction of the Mashers and the Raiders. John and Mike heard the rumours. John heard from Eddie. “So what?” was John’s response. The arrangement was for the Leaguers to play first. They won the right through a toss of a coin; they thought that the longer rest between games would help. Lots of parents showed up for the Leaguers’ game. The Mashers and the Raiders watched the game (their coaches encouraged them to “scout” the other guys). However, they had trouble concentrating on the game. They looked instead at the crowd, and were horrified. The yelling and barracking of the parents, toward the players, coaches, and umpires, was a revelation to the Masher and Raider players, who had had few if any parents at their games. As well, their games had been far more friendly, though no less well-contested. The Leaguers’ contender for the championship was chosen, in seven noisy innings (seven innings being the Little League standard; the Masher-Raider games were nine innings). The losers and their parents left, and most of the winners and their parents went off to find lunch. The Raiders and the Mashers were still looking stunned as they readied for their game. John and Mike didn’t like the look of things. They gathered the boys around them in the part of the park beyond left field. John spoke: “Look, you guys. You saw how things are at a Little League game. We know that we play a different kind of game. Vow, we’ve all been having a good time this all Summer, and that’s what we’re gonna do right here and now. Whoever wins right now takes on the Little Leaguers. That team will show them what fun playing ball is. The boys cheered, and felt a great weight lifted. John said to Mike, “what do you think? I think either one of our teams can win”. The Masher-Raider game went well. Though the League would provide the umpires for the big game, the man who had been the umpire for the Masher-Raider games all Summer long officiated at this game. The two teams knew each other well after the long summer, and they were evenly matched, so their game was closely played, with the Mashers winning in the bottom of the seventh with a well-placed single with a man on second. The Raiders did not leave like the losers of the Little League game had. The Raiders and the Mashers had become great friends over the now-too-soon-past Summer and knew from what they had witnessed that morning that the Mashers would need their support. The morning game had started at ten o’clock. The Mashers and the Raiders had played from noon ‘til one or so. The big game would start an four, which gave the Mashers time to rest and get a little lunch. Their umpire produced sandwiches and drinks for the two teams. The boys knew little about this mysterious man, though they knew that John knew him, and that was good enough for them. Apart from being polite and calling the games, the Ump (for the kids really didn’t know his name, and called him “Mister” or “Mister Umpire”) was a quiet, kindly man, who seemed to enjoy everything about the games, but from behind a wall of reserve. “He’s a lot like my Grandpa in Ohio,” said one of the Mashers. At three-thirty, the Mashers, who would be the home team, took the field for some infield and batting practice. They left the field at three-forty-five, in enough time for the “Yankees” to get in a little practice. Line-ups were presented at four o’clock, and the first pitch, a strike on the outside corner, was thrown by Ritchie Matthews at four-oh-two. The game went along quickly, with the Mashers scoring in the first, third, and fourth, and the “Yankees” scoring in the second, third, and fourth. The Leaguers broke the game open in the fifth with a four run rally, taking them to a three run lead. They augmented their lead with two more runs in the sixth. John was on his third pitcher and was worrying as the Mashers came up in their sixth. But, it was the turn of the Leaguers’ pitcher to tire: they had used him to start the morning game. The Mashers came up with five straight hits, three for extra bases. Only a good play at the plate kept the Mashers from really piling it on. The seventh inning found the game tied at nine. A close (and thus, noisily contested-by-parents) play in the top of the eighth stopped a rally by the Leaguers, but not before they got three runs. The Mashers went down in order in their half of the eighth, and though they looked demoralized, they managed to pull themselves together to dismiss the League team 1-2-3 in the top of the ninth. The top of the order was due up for the Mashers in the bottom of the ninth. The lead-off batter hit the first pitch between first and second, and only dire and deadly threats from John kept him from trying to stretch the hit into a double. The Leaguers and their supporters were feeling complacent, figuring that they had the game in the bag. The smiles kept up even after the well-executed hit-and-run that put Mashers on first and third. A line drive down the line past third base, bringing in two runs, and leaving a man on second caused the light to fade from their faces. A pop-up by the Mashers’ big catcher, followed by a grounder to second brought the light back. The Mashers had two runs in, a man on third, and two outs. A single brought the man on third in to tie the game. Then, a line drive went between third and short, bringing in the runner on third, and replacing him there with the batter. The game was tied! Eddie came up. He was scared, but determined. The people in the stands started yelling louder. The players on the other team became more and more insulting. Eddie was undaunted. Doing as John suggested, Eddie took the first pitch, which was way outside. So was the second and the third. On three-and-oh, he swung at an inside pitch and fouled it back. The League pitcher was tiring. The next pitch was outside, but not very far outside. Eddie swung at it, and lofted it just over the second baseman, allowing the runner on third, who was off with the pitch, to score easily. The Mashers won, 13-12. The majority of the Little Leaguers left the field without shaking hands with the victors (John had told the Mashers that they were to go to the Leaguers and shake hands, if they lost), and the coach ignored John, moving quickly to his car, ahead of his wife and son, who were letting him (the coach) know that he had not left his son in the game long enough “and so cost us the game”. Other recriminations were being uttered in the diminuendo of the retreating crowd of Leaguers and their families and supporters. Meanwhile, the Raiders were proud of the Mashers. Both teams vowed to play the next week at Jefferson. They did, and then called it a season. The crispness of September was bringing out a desire for football thereafter. Throughout the school year, the Mashers talked about their summertime exploits, both at Jefferson, and at St. Columban’s, the parish school. The coming of Spring brought gloves, bats, and balls out again, but a repetition of the previous Summer was not to be. John, and for that matter Mike, had full-time jobs, as they were getting ready to go to universities in the Fall. The players were outgrowing their uniforms, which they got to keep. We moved away from Royal Oak that Spring. One evening after supper, when John sat down to relax after a long day, Eddie came to sit with him. The years went by quickly. “Mashers’ Field” along with the what was left of Mr. Ring’s farm became the new golf course. Baseballs would never again be lost in the high grass beyond left field. The Pollywog Pond, too was swallowed up by the golf course, ending the Springtime tradition of filling jars with pond water and a few tadpoles. Winter hockey games were gone, too. The last wooded area of that part of Royal Oak was gone, ending summers of adventures in the woods, cool on hot days. In time, Jefferson School was closed as a school, its building to house the offices of a cable television company. The schoolyard was sold off, too, for house lots and light industry. Gone was the bench that Mr. Evans, our custodian had built around the big oak tree on the kindergarten wing of the school. (Gone now is the oak itself.) The field that the Mashers played on is paved and a parking lot. John teaches English in a school in South-western Ontario, having gone there to avoid the draft during the Viet Nam War. Years later, on a visit to Royal Oak, I came across Eddie. We barely knew one another at first, but after a while, he said, “Aren’t you…” and I said, “Yes, and you’re Eddie…”. Having left Royal Oak at a relatively young age, I hadn’t kept in touch with the kids I’d known, as I usually came back to see my sister. Eddie had me come up to his place on Crooks Road, across from Kimball High. We had a couple of beers, and talked of our school days. He left the room, but returned quickly, holding his small Mashers shirt, which hung on a hanger. The shirt was so small on the hanger… It had been so large on Eddie all those years ago.